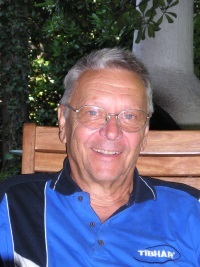 Radivoj Hudetz is a 70-year veteran of table tennis and the Chairman of the ETTHoF board. He's the coach of Bayern, the German junior team, the Yugoslavian national women team, and the Yugoslavian champion women team HASTK Mladost Zagreb. He's an author of several books on table tennis techniques, tactics and history. He's also the chief editor of table tennis periodicals “Tischtennis aktuell” and “SPIN”, and an author of several films and DVD’s on table tennis. He's also the former president of Yugoslav Table Tennis Association and the former General secretary of Croatian TT Association. He was the tournament director of World Championships 2007. Currently he's a honorary member of ETTU and a member of ITTF President Advisory Council. He's been honored with ITTF award of merit, with the Croatian Table Tennis Association’s Trophy and with the Sport Award of Croatian Republic. The year is 1982 and a young Vladimir Samsonov has just begun playing table tennis at the tender age of 6. At first he went to a club but was told that he was too young. As a result, his father became his coach. The following year he became a member of the club and was soon recognized as a prodigious talent and was put into the cadet selection. As a member of the Minsk cadet selection, he traveled each month to Moscow and stayed there for a fortnight to practice with the Soviet Union's cadet selection. The Soviet school program became his training program! For the first time, Vladi, at the age of 11, attended the European Cadet and Youth Championships in Athens in 1987. He won gold with his cadet team, although he was sitting on the bench as a reserve during the event. In singles, he sensationally won a bronze medal! A year later he won gold in the cadet mixed doubles with Kusch. His time came in 1989; in Luxembourg he became European cadet champion and delighted spectators with his technically perfect game and wonderful feeling and touch for the ball. By the end of that year, the editor of a table tennis magazine asked me to write an article about the changes that were going to happen to table tennis during the last decade of the century from my point of view. My vision in that article ended with a statement: that among the best juniors and cadets in 1989, there is the future year 2000 World champion. His name is probably Vladimir Samsonov. Vladi did not become World Champion in 2000, but he did start that year as number 1 in the World ranking list. A year later, it was almost impossible to recognize Vladi when he came to the European Cadet championships in 1990. He suddenly became a very tall boy. He grew by more than 15 cm in a single year. As per the course of teenage awkwardness, he temporarily lost his wonderful coordination and it took him one year to get everything back. At the end of his cadet and junior career, his wins were an almost unbelievable balance spread between the European cadet and junior championships. Altogether, 13 gold medals and many silver and bronze medals were won. He was once cadet champion in singles and twice junior champion in singles. As long as the Soviet Union was alive, it was not possible to make any sponsored contracts with players from the USSR. Their TT Federation had a contract with one material supplier and all national team players had to play with that equipment. Vladi, of course, also had no other options. Despite any adversity he may have faced under Soviet rule, he still went to the European championships in Stuttgart as a member of the men's team in 1992. At that time, the USSR had already collapsed, but in table tennis and other sports it was not possible to recognize and integrate all of the sport federations of the newly independent states into any ongoing championships. Just like in some other sports, the USSR team appeared for the last time in Stuttgart 1992. Though not under the name of the non-existent USSR, but as the “Union of Independent States”. It was at that point clear that Vladi would play for Belarus. This meant that he would not have the ability to practice at the Moscow training camp. His future in table tennis became uncertain as he would not have the same type of training that he had before. TIBHAR then approached Samsonov and his coach Petkevich, becoming his material supplier and sponsor. With the help of German chief coach Eva Jeler, Vladi was invited to the German Olympic center in Heidelberg where he stayed for one year. This was vital for his development. For Vladi and TIBHAR it was the beginning of a wonderful life time of cooperation. Vladi is an exemplary sportsman, well deserved of the title “Gentleman Vladi”. From 1996 up to 2011, he was among the 10 best players in the world by the end of the year for fifteen years straight. He also repeated this achievement in 2013 and 2016. With his experience, Vladi has helped his life time sponsor TIBHAR in the development of new products. At the German Olympic center, Vladi had very good practice during the 1992-93 season. Soon, club managers found out that in Heidelberg, one of the young and extremely talented players was practicing and offered him contracts for the new 1993-94 season. But Vladi ran into a problem that season. He was the only one to stay in Heidelberg during the weekends. Each weekend, the players who were there during the whole week went home to play for their clubs and Vladi was left all alone in the entire center! He asked me for help, I asked my friends from the Bayern Munich TTC to take him into their team for the remaining half of the season. Before his first match for Bayern, a friend of mine who was a well known coach, called me and told me that Vladi should not come to his first match in Munich. He told me that the team had to play against the best player in the league, a defender, and Russian players had no idea how to play against defenders. He thought that his new club would be disappointed with his first performance. I knew that Vladi had practiced for his whole life with his friend Shchetinin who had internationally become a very good player. With that experience and his fantastic touch, Vladi became a king in playing against defenders. So, Vladi went, in spite of it all, to Munich and easily won his first match against the dreaded defender. After the half-season in Munich, which he ended without defeat, he made a choice between several offers and signed for Borussia Dusseldorf. He thought that he would have the best chance to improve his game with the team that had the likes of young German national team players such as Rosskopf and Fetzner along with the ambitious coach Mario Amizic. Vladi won the European Champions league three times with Borussia Dusseldorf in the following years, then went to Vilette Royal Charleroi and won the European Champions league 5 times and the world cup once too. After Charleroi, Vladi played for two years in Spain, changed again to Fakel Gazprom Orenburg, and won the European Champions league 4 more times with his new team. With 12 wins in the ECL while in different teams, Vladi has been by far the most successful player in the ECL ever. He is also deserved of the name he got from the press: “Mister ECL”. At the world championships, he won 2 silver medals and 1 bronze medal. At his only men's singles final, he lost against Waldner. Before making it to the finals, he beat the 3 best Chinese players in a row! He participated in the Olympic games from 1996 to 2016, a total of six times so far. Three of the times, he had lost the final match just before earning a medal. Table tennis played by Vladimir Samsonov can be compared with tennis played by the great Roger Federer; the same ease of movement, elegance, perfect ball touch, and anticipation. Like Federer, he does not have the strongest shots but the ball will always land in the most difficult place for their opponent. In China, they call Vladi the “Tai Chi Master”, meaning he is a player with perfect allround skills. Vladi is widely known for his sportsmanship, the ITTF awarded him the Richard Bergmann Fair Play Trophy three times. More times than anybody else. I think I witnessed the only time in his career when Vladi got a yellow card for misconduct. He was playing in a Pro-tour match against Czech world class player Petr Korbel. Korbel hit the ball on the edge of Vladis half of the table but the referee did not notice it and counted the point for Vladi. Knowing what actually happened, he told the referee that the ball was good and the point should be counted for Korbel. The referee rejected this assertion and Vladi played his next return purposefully into the net to give the point back to Korbel. The referee had then immediately shown Vladi a yellow card! As far as I know, this ridiculous yellow card for “misconduct” was the only one Vladi has ever received! At the age of 41, Vladi still stands among the best players in the World. He has been elected as the Player Representative, the Chairman of ITTF Athletes Committee, and is a member of the ITTF Executive Board. In the coming future, Vladi will eventually stop playing, but will hopefully remain in table tennis in one way or another. He is married to his beloved wife Natascha. They have two sons, Viktor and Ivan, who do not play table tennis. 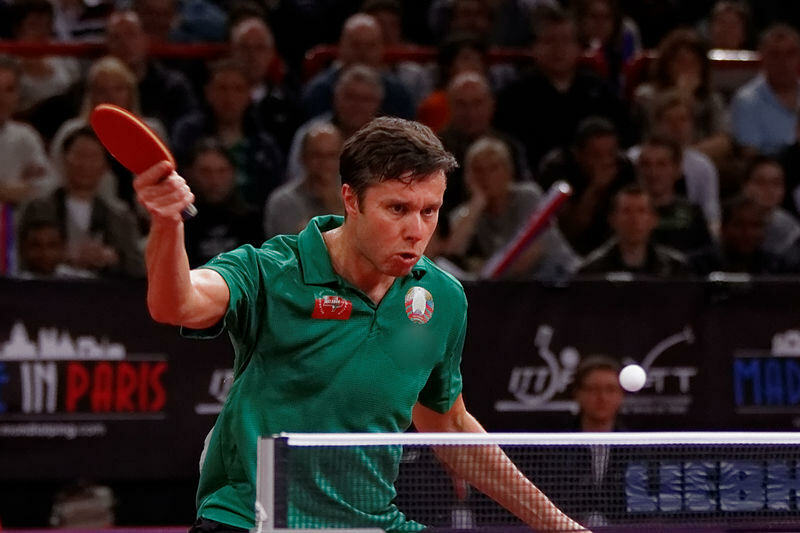 Samsonov is a true inspiration for all table tennis players across the world. As long as the Soviet Union was alive, it was not possible to make any sponsored contracts with players from the USSR. Their TT Federation had a contract with one material supplier and all national team players had to play with that equipment. Vladi, of course, also had no other options. Despite any adversity he may have faced under Soviet rule, he still went to the European championships in Stuttgart as a member of the men's junior team in 1992.